Spring is here, so lets hit the road for some wine tasting in Santa Barbara, California. At the end of last summer myself and fellow Vino-ista’s hit the rails for wine tasting with the perfect designated driver, Amtrak! Instead of pouring over all the fun we had, I’m going to show you how plan the perfect Train IT! Day Wine Tasting Trip to Santa Barbara. Once you have picked the perfect sunny day, check Amtrak for the train and schedule closest to you.Those in San Diego and Los Angeles Counties the Pacific Surfliner is ideal. Depending on your location, plan to take the first or second scheduled train in the morning and last train leaving. Tasting rooms normally open after 11am. Plan accordingly. 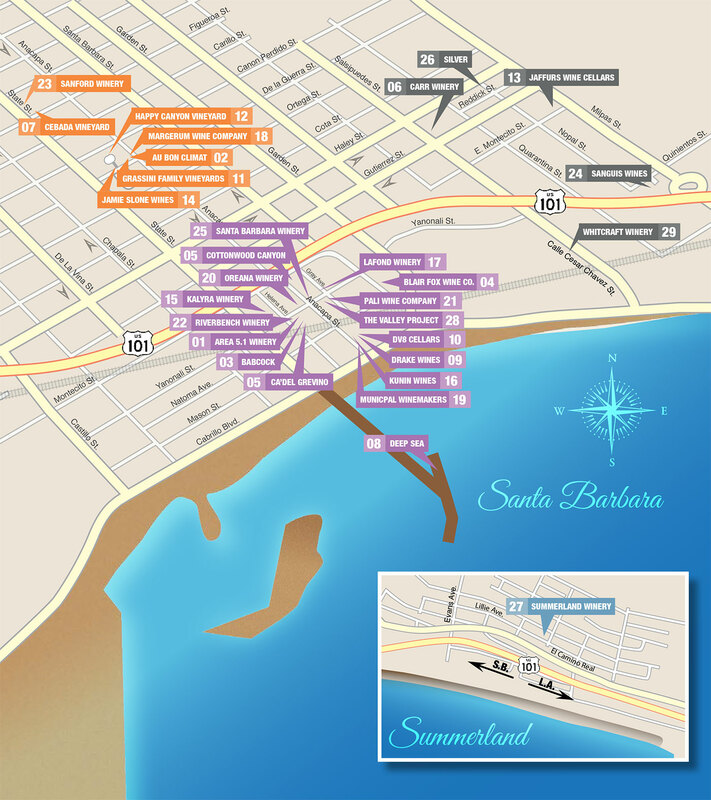 Santa Barbara County has created a little mecca in Downtown SB bringing over 20 wine tasting rooms to a central location, the Urban Wine Trail. In thinking about your day, decide what kind of tasting group you will be. OR maximize my tasting day planner? Either type should use Urban Wine Trail Map (UWT) to aide your day. If you are the maximizer, plan head by using the the UWT website to determine which tasting rooms work best for trying as many wines as possible. I would recommend stopping first at AVA Santa Barbara. Their tasting room features a chalk drawn AVA map of SB that gives a sense of where the wine you will taste all day will come from. Don’t want to walk everywhere? You are in luck! Downtown SB runs a Shuttle from Waterfront to Downtown only for .50 cent each way. Its route will take you up and down State Street and picks up in front of the train station. If you get hungry between tastings there are plenty of eateries that range from fine to casual dining. My favorite stops are Norton’s Pastrami and Zen Yai Thai There are a varieties on options for entertainment and shopping. Don’t forget the beach is two blocks from the station. Any Questions? Leave them in the comment box or tweet me! Tags: #amtrak, #santabarbara, #trainIT, #urbanwinetrail, #vinoista, #vinoistalife, #winecountry, #winetrain, @downtownsantabarbara, restaurants, wine. Bookmark the permalink. Soo helpful! Thanks soo much! I can’t wait to try this out! I’ll be planning a day trip soon thanks to you!